You can install a store-bought radar detector without needing to pay for professional installation. Here's how. A radar detector will notify you if your speed is being monitored by police, so you can make an adjustment before your receive a traffic citation for speeding. It should be noted that some states prohibit motorists from employing a radar detector while driving. While there are a lot of radar detector products on the market today, it's important to do some legwork before making your purchase. We recommend buying one that provides the widest range of detection possible, which might include X, K, Ka and laser bands. Also, check the quality of the visual display and range of volume. Extra features are also available, but will boost the cost dramatically. Let's go over how to install your new radar detector once it's purchase. State law may prohibit you from installing or using a radar detector in your truck while driving. Therefore, it's highly recommended that you do your research (diligently) before taking the time and paying the cost to install a radar detector in your truck. Figure 1. Police may monitor your speed at any time. 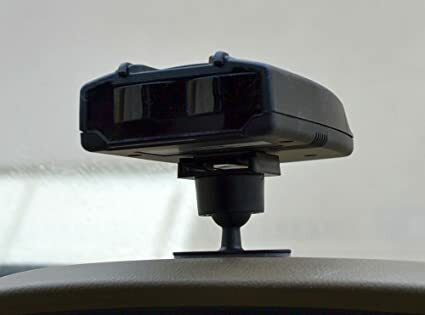 Many units today come with a suction cup mount, which you can use to mount your unit to your windshield for optimum (unobstructed) viewing. You can also mount your unit directly to your dashboard, particularly if you wish to keep it from out of view. Most mounting systems allow for quick as well as easy mounting and detachment with easy to loosen brackets or Velcro fasteners. Figure 2. You can mount and un-mount your unit as needed. If you wish to hide the cord, it's advisable to run it through the top vents, using a screwdriver to push the panel out of your way (downward). Use electrical tape to eliminate any snagging once the cord is in place. You could also move the cord further, allowing it to exit out of your cigarette outlet. You don't want to be fiddling with a radar detector while driving, so be sure and test out how your unit works before heading out. It's advisable to also familiarize yourself with any and all features and buttons, as well as to have a working understanding of how to read the visual display. Finally, be sure your unit is mounted in a location that provides a clear and unobstructed view while driving. You may want to avoid mounting it in locations not recommended by the manufacturer.